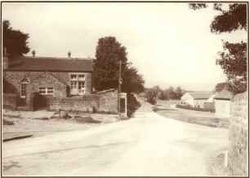 From 1832 when it was opened, until 1976 the hamlet had its own school, which served the local community, including Burley itself. With two teachers, this Church of England school catered for about two dozen children aged between 5 and 11. There were two classrooms, a cloakroom, two outside toilets and a small playground (which was also the repository for the boiler's coke supply). An additional playground, of course, was Burley Moor itself, with many hours spent playing “Hide & Seek” amongst the bracken. Many Nature Walks were taken over the moors to Ilkley, invariably looking for flint stones. When the school had been closed it was used as a Field Training Centre for a while. After that, the local authority pondered with the idea of moving it stone–by–stone to Bolling Hall in Bradford, and re–building it to become a museum piece, complete with re–enactments. This idea was abandoned, probably due to the cost, and the decision was taken to sell it. The school was sold privately in the late 90’s. The “old school” has since been converted to a private residence, keeping much of its original structure. It is easily identified, as it overlooks Woodhead Green, the grass triangle at the top of Moor Lane, and is adjacent to one of the many footpath access points to Burley Moor. 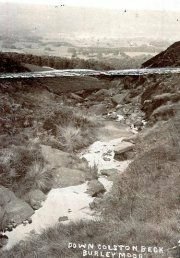 Both of these photographs have been taken looking along the moors road towards Ilkley. 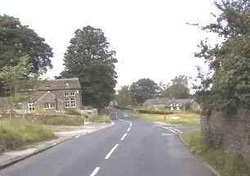 The large building on the left is the school, and the junction of the road down to Burley (Moor Lane) is on the right.